This week is Staff Appreciation Week, but today specifically is Teacher Appreciation Day. For awhile now, I've been wanting to use Michelle Wooderson's idea to make covered notebooks. I needed a small gift for each of Sabrina's teachers, para aides and therapists at school, so I thought this would be perfect. After all, who doesn't like notebooks?! These are junior notebooks that were cut in half to make skinny notebooks (approx. 2.5" x 8") which are perfect for lists. I purchased a pack at Office Max, then I went over to their printing/binding desk and asked them to cut them in half for me with their heavy duty guillotine paper trimmer. I stamped and colored Teacher Anya with Copic markers. Then I cut her out and popped her on the Nestabilities label. I added Star Dust stickles to the apple for some bling. On the left is the front cover of the notebook and on the right is what it looks like inside. Stamps: Teacher Anya (The Greeting Farm), Teacher's Apple (PTI). 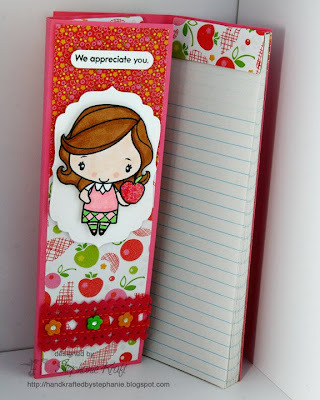 Accessories: Labels Four Nestabilities (Spellbinders), Cuttlebug (Provo Craft), Markers (Copic), Word Window punch (SU! ), Felt ribbon (K & Company), Rhinestones, Foam tape. Very cute! And I had no idea Office Max would do things like that. Happy Bday, btw! Hope you're having a great one! What a great gift for the Teachers. Your Anya is just darling! I love her cute little outfit. Oh, Happy Birthday! I hope you have a great day! Thanks for the great gift. I love it! :) So cute.